Navigating the AccuScore site is easier than ever. There are two primary methods to make your way to the expert picks pages for each individual sport. No. 1: AccuScore now has each sport listed on its top bar. Clicking on “Hockey” will take you to the NHL picks page. On that page, you will also have a box that links to every sport AccuScore covers. No. 2: AccuScore now has a pop-up side menu that allows you to directly navigate to the picks page for every sport on AccuScore’s website. On the top left of every page on the site, you should see a small box with three bold lines in the middle. Click on this box, and a new side menu will appear to launch a list of links to every sport on the site. Click on any of these to advance to the expert picks pages. AccuScore has repackaged its simulation data to make it easier to understand. Also, we’ve reserved more information for members than ever before. AccuScore no longer gives out free simulation previews for free for every game. AccuScore still provides free previews, but the site now only shares one free game for every sport, picked at random. For these preview games, full forecasts, analysis and trends are included. But that’s all you get for free. If you want any information on the thousands of games AccuScore simulates, picks, analyzes and tracks, you have to be a member. Also, AccuScore still has its point spread and over/under slider tools. These now can be accessed by clicking on the "view more" link at the bottom of the box for each individual game. In the grid, you will find AccuScore's simulation percentages for each game side-by-side with public ML odds converted into a percentage. You'll notice that the odds add up to over 100%. This is not an error. Oddsmakers skim a bit off the top. In the past, we would have lowered these percentages to be out of 100% by removing the Vegas edge, aka the Vig. Instead, AccuScore now shows you the true percentages Vegas is attributing to give you a better look and determine when there is true side value. Also, lines are listed with relation to the bottom team, i.e. bottom team -1.5. Also, the star ratings for each of AccuScore's picks are visible in this setting, and members can actually re-order the list by star rating by clicking on the arrows at the top of the "ML," "SV" or "Total" columns. Further, AccuScore has a search tool to help you find any game by typing in the team name. This search bar is displayed in the example below under the red arrow. AccuScore now shows its moneyline picks and side value picks with two circles that represent odds and AccuScore simulations. 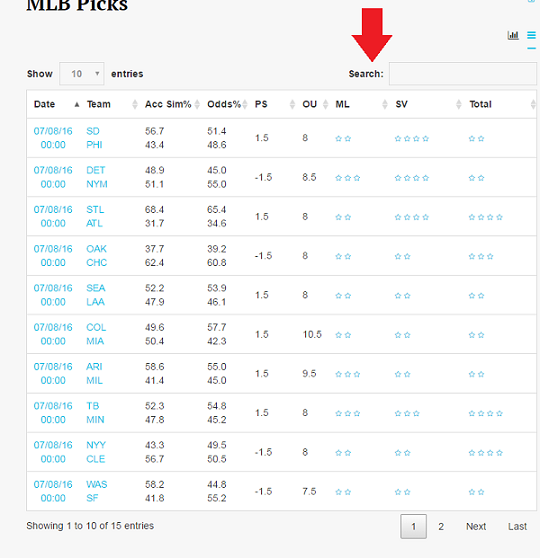 Side value is the value that AccuScore calculates based on its simulations when compared directly to Las Vegas odds. Hovering over the inner circle shows that the public odds calculate that the Phillies only have a 45.4% chance of winning the game. As such, the inner circle shows 7.7% side value on picking the Phillies to win, and this side value is represented by darker blue shading. 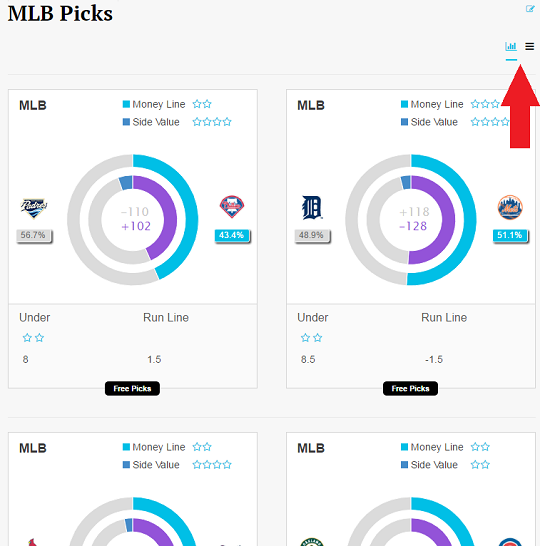 At the top of the same box with the circles showing AccuScore’s projections, the computer lists the star-rating of its moneyline pick and its side value pick for the game. AccuScore’s computer still takes into account numerous trends to arrive at its star ratings. Also, at the bottom of the box, you should find AccuScore’s Over/Under pick and its point spread pick with star ratings. We understand that every sports book does not give the same odds, and so, AccuScore has a slider tool that allows members to adjust point spreads and totals lines. This tool was previously on the Expert Picks page, but it is now found inside the game forecast. Members can slide the tool using the round button to adjust lines and also adjust lines using the arrows next to the Team Names. Hovering over the shaded parts of the circles clarify which team is grey versus which team is blue. A tab at the top of the slider tool section within the forecast allows members to change from the point spread tool to the Over/Under tool. These tools should be familiar to long time AccuScore members, though the graphics have been updated. The Over/Under tool works the same way as the Run-Line tool, which is called the point spread tool for basketball and football. At the top right of any page on the site, you will see the words “REGISTER” and “LOGIN”. If you are already a member, click the “LOGIN” button, and you will be taken to a page where you can log in using your credentials. This will unlock the hidden picks and provide you full access to all forecasts, analysis and predictions if you have an active membership. If you are not a member, please click on the “REGISTER” button and complete registration to become a member.